July and August requires a minimum seven night stay. Shorter stays are welcome during all other months. The owner is extremely responsive and happy to help with recommendations regarding transportation, suggested activities and other recommendations. I grew up north of Boston but live in the South. I am a responsive home owner committed to making sure my guests enjoy my home and the island as much as I do. I travel to the island frequently to enjoy and check on "Hunky Dory". I have a caretaking company to handle any issues that may arise during your stay. I am easy to reach by cell phone, text or email if there are any questions or issues that arise not covered by the house instructions. I have been a member of the Chamber of Commerce since 2003 when I first began renting out "Hunky Dory". I love to sail, kayak, bike and eat great food when I am on island. I also surf at Cisco beach and hope to get better each year. I had looked for the perfect Nantucket home for almost two years when I found "Hunky Dory". It was love at first sight even before I had stepped inside. It was the house I dreamed of finding, historic, light filled and the perfect location. Many island owners have quarterboards with their house's name carved in wood. A book about the history and meaning of different Nantucket quarterboards was written a few years ago. My quarterboard has its name and carvings of Brant Point and Sankaty Light, along with island flowers. I chose the name because when I am at the house enjoying family or friends, everything really is hunky dory. I had loved vacationing on the island for years before I bought "Hunky Dory". I wanted a home close enough to downtown to easily walk there, especially in the summer when it is very difficult to find parking. I also wanted to be close to the Surfside bike path and the harbor to kayak. Having a home large enough to enjoy with my family and friends, but with history, was very important. I wanted a home with character that made me feel very connected to the island's history. Myself and my VRBO guests have celebrated many happy occasions and made many cherished memories at "Hunky Dory." I love hearing what history my guests have with the island or why they will be visiting. I also love to hear from first time island visitors about how they fell in love with my house and the island. I really enjoy spending more time there during the different seasons since my home is always booked all summer! "Hunky Dory" has a large grass backyard compared to many homes in the historic district. It also has a large brick patio area with beautiful landscaping as well. On Nantucket it is more fun to be outside, even for meals during the nice weather, so I have picnic table seating for 11 and a children's picnic table as well. Having enough room and a safe enclosed area for children to play or adults to have a quiet spot to read or relax is a wonderful benefit of this home. When you have to be inside, the home has lots of windows and light. The narrow lane the house is situated on is quiet and residential. The Surfside beach bike path is at the top of the street. After the beach or biking, nothing beats a hot shower outside in the private enclosed outdoor shower. At night you can even enjoy a shower under the stars. I love the outdoor shower so much I had one built at my home in the South, which I enjoy year round. My guests love the large kitchen to hang out in or eat since it comfortably seats 11 people. Two wonderful historic sites, the Old Mill and the second oldest African American Meeting House are a 3 minute walk from the house. The walk from the house to Main Street is a sidewalk passing gorgeous mansions and flowers. "Hunky Dory" is in the historic district, a very short walk past gorgeous mansions to main Street. In the historic district and a less than ten minute walk to Main Street. High quality nautical themed sheets and quilts. Extra sets provided. A new high end wireless router is provided. The living room/den has three couches and a chair with tables, tv/dvd and bluetooth speaker. it also has many coffee table books on the island. Beach toys are often left by guests. Large private brick patio in yard enclosed by fence and twelve foot hedges. We had a great weekend at Hunky Dory! Everything looked as pictured online and Kathleen was quick to answer any questions I had along the way. I hope we can come back soon! I hosted a bachelorette party for my sister-in-law at this house a few weekends ago. Kathleen was super accommodating with our request for an early check-in, and in general was very quick respond to questions. The house is super cute and a great location to everything we wanted to have access to--downtown, The Chicken Box, etc. Lots of space for inside and outside hanging. I cooked a few of the meals at the house and found the kitchen to be very well stocked. All the girls commented on how great the house was as well throughout the weekend. If I plan a larger group event again on ACK, I would definitely use this house. Great place to stay. Awesome outdoor area! Very nice and well kept place to stay. Everything was in order, very well equipped kitchen, bountiful beach gear, and a lovely outdoor area. The owner was prompt and thorough in her communication, and it made traveling a breeze. Perfect place to stay with a group of friends or family. Hunky Dory was a perfect house for our family (6 adults, 1 infant) & Kathleen (the owner) was very, very helpful. We really enjoyed the house, easy access to the town (restaurants & bars). Also, easy to pop down to the grocery store or out to all the beaches. Spent a lot of time utilizing the outdoor space, had 1 large family BBQ, which was nice. Outdoor shower is perfect, used it every day, wish I had one at my house. Great all around, exactly as advertised. Great house for families! Lots of room, well-equipped kitchen, beautiful dining table for enjoying lobster feast, nice living room areas! Kathleen very informative and responsive. 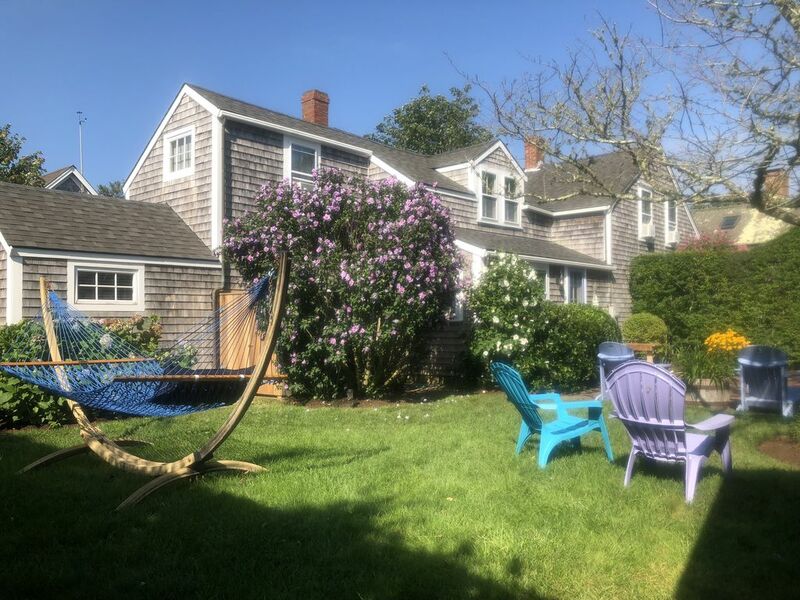 Well kept house, great amenities (towels and beach chairs were an awesome convenience) and walking distance to town during a busy month were key! Two of the island's most historic sites are within a very short walking distance, One of the oldest operating windmills in the country is located just a three minute walk from the house. The second oldest African American meeting house is a two minute walk from the house. Both sites offer tours. The whaling museum is a leisurely fifteen minute walk from the house. A lease must be signed and if children are guests, Mass. law requires a lead disclosure be signed.